Magical realism from the author of “Mr. Marmalade” appears precious and repetitious while creating an otherworldly mood. According to the publicity materials for Noah Haidle’s Smokefall, the latest dysfunctional family drama to arrive on our stages, “magical realism collides with manic vaudeville.” The play uses a narrator (called “Footnote”) but so does Tennessee Williams’ The Glass Menagerie. 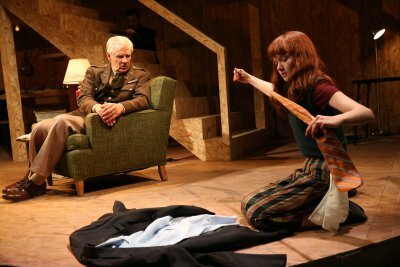 In the middle section of the play, the two unborn sons argue and debate, similar to Thornton Wilder’s one act, “Infancy.” True, the teenage daughter Beauty refuses to speak but this is a result of her overhearing her father in a fight with her mother saying that all he wanted was peace and quiet. Beauty has taken to eating earth and drinking bark, but her family tends to ignore it and it doesn’t seem to hurt her any. Haidle’s previous New York plays, Mr. Marmalade and Saturn Returns, flirted with non-realistic situations, but Smokefall is the most precious and facetious of the bunch. In Act One of this three act play performed in two parts, we are introduced to a family that has problems. The father Daniel, who has been depressed for some time, most recently by the news that his wife is about to have twins, will drive off on this day and never return. His pregnant wife Violet heavy with twins is also coping with her elderly father, the Colonel, a widowed retired army officer, who is continually getting lost and is beginning not to recognize his family. And Beauty has taken to her own devices to deal with the unspoken problems. 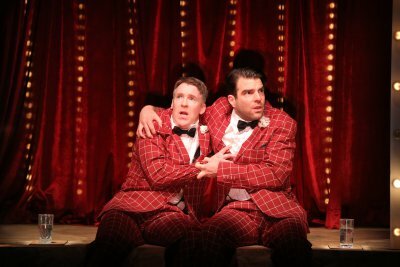 In Act Two, Fetus One and Two of Violet’s soon-to-be born sons, dressed in red and yellow striped suits and black bow ties like in a cabaret, argue philosophy such as Michel Foucault, original sin and post-structuralism. The third act takes place 84 years later where we meet Johnny, Violet’s son (Fetus Two), now a senior citizen living alone in his mother’s house, who receives a visit from his own son Samuel on the occasion of his birthday. Looking not a day older, Beauty also shows up having been seeking their missing father for the last 74 years. The play seems to be saying that life is full of suffering but love will conquer all, not a very new or profound message. One flashback (Violet and Daniel’s first date) is replayed at least three times with no new significance with each repeat. The title is a quote from T.S. Eliot’s The Four Quartets: “The moment in the draughty church at smokefall/ Be remembered; involved with past and future./ Only through time time is conquered.” Unfortunately, like a great deal of late T.S. Eliot, these lines are too abstruse to have much bearing on the play. Smokefall is the sort of work that you either go with its whimsy or hate it. This is definitely not a play for all theatergoers. Directed by Anne Kauffman who has piloted a great many new and avant-garde plays, the talented cast is surprisingly bland. Rising star Zachary Quinto, the award-winning actor of the most recent revival of The Glass Menagerie and Signature Theatre’s revival of Angels in America, is rather colorless as the narrator “Footnote,” but is much more vivid as the argumentative Fetus Two, and later the patient great-grandson Samuel. Robin Tunney’s Violet is sweet and submissive but changes not at all while we see her in the first act. As Daniel, Brian Hutchison is a bit of a cypher as we are told very little about the causes of his depression. However, he is much more vibrant as the contentious and pessimistic Fetus One who isn’t sure that he wants to be born. Since Taylor Richardson’s Beauty says almost nothing for most of the play, she is unable to reveal much. Most effective is Tom Bloom as first the senile Colonel in the first act and his reclusive and negative grandson Johnny in the third act: both characterizations are amusing and revealing. Mimi Lien’s unattractive flake board setting for the two story Grand Rapids, Michigan, home is distracting in the first act, but the reasons for it become clear in the third act. In between, a small backstage area behind a red cloth is revealed for the extraneous though comic second act. Asta Bennie Hostetter’s costumes are basically realistic except for the clown or vaudeville outfits for Fetus One and Two in the middle section of the play. David Weiner’s lighting design is most in evidence in this fantasy section. Smokefall like other Noah Haidle plays is a fantasy on the familiar theme of the dysfunctional family. Whimsical most of the time, clever at others, it will please some, and put off others. In this reviewer’s opinion, its offbeat and idiosyncratic format does not reveal anything new about families or how we should live our lives. Heavy-handed direction does not obliterate the power of these two finely acted masterpieces by a relatively neglected playwright ripe for rediscovery. Film stars Janeane Garofolo and Lili Taylor headline first Broadway production of Scott McPherson’s dark comedy of death and dying. New Sarah Ruhl play which travels from the U.S. to India receives beautiful, transcendent production but its subtle message is rather obscure. Fascinating but densely written new play about the Black gay experience, circa 1963, by new playwright Donja R. Love.